Sør Amfi Arendal in Norway was completed in August 2012. 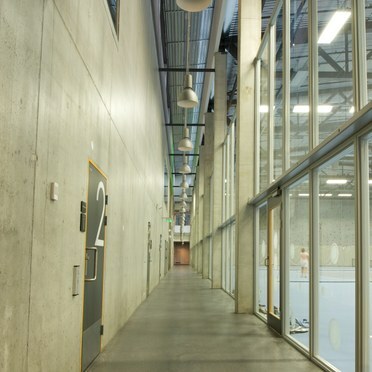 The facilities, which are a joint project shared by the city of Arendal, Aust-Agder and the sports community, consist of an indoor tennis hall, sports hall and gymnasium, plus an administration building, VIP rooms and fitness centre. Outside, facilities include tennis and volleyball courts, as well as parking areas and landscaped features. 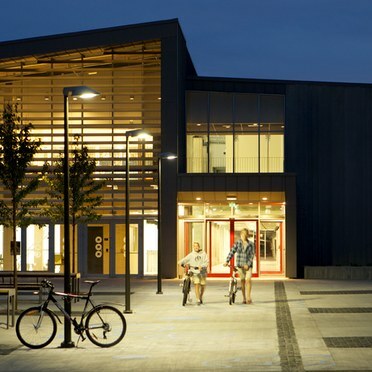 In cooperation with electrical contractors Agder El.Installasjon AS, Thorn supplied the outdoor and indoor lighting, primarily for the common areas where people gather and move around. The contractor and architect's design consultant played a leading role in the choice of luminaires. Of the seven luminaires selected, Clan C LED is used in the car park and walkways to the building, as well as the volleyball, skate and tennis courts. Chosen for its subtle, modern properties, Clan C LED offers a wide and consistent design theme covering three bracket collections, two optics and 15 lamps. Clan C LED additionally provides street or asymmetrical lighting distributions and includes dimming and control options to optimise energy consumption. The state-of-the-art LED versions chosen for Sør Amfi Arendal(39W, 58W) comply with EN13201 and have an expected lifetime of 50,000 hours (@L80, Ta 25°C). Integrated dimming further reduces energy consumption by up to 50 per cent in comparison to aged installations, with no compromise on lighting levels or the quality of light. Clan C LED delivers light where it is needed without spill and by using fewer lanterns. The precision optical design around individual LEDs gives better spacing and uniformity compared to more conventional light sources. 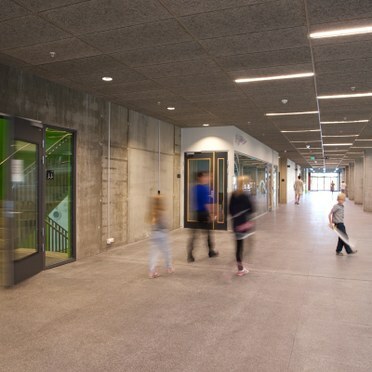 The installation at Sør Amfi Arendal additionally features the Identification Visibility Safety (IVS) system to enhance pedestrian safety with a dedicated double asymmetric optic. The use of additional signaling makes it easy for drivers to see pedestrians on the pavement and kerb from a distance, while pedestrians are able to clearly view the pavement surface, obstructions and other pedestrians. The IVS system is mounted at the same height (between 4 and 7m) and uses the same consistent body design throughout the scheme for total unification. Paal Dokkedal, Agder El. Installasjon AS says: "We are very satisfied with all the outdoor and indoor luminaires provided by Thorn Lighting. 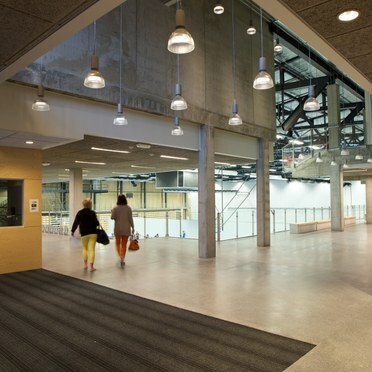 They complement the modern environment we have created here while minimising energy consumption and providing quality light at Sør Amfi Arendal." For indoor lighting control, simple stand-alone solutions from Thorn are among the systems used, which means the individual areas can be controlled independently to each other. They include SwitchLite, SensaDigital and SensaDAY. The lighting has been delivered in cooperation with electrical contractor AgderEl.installasjon.